FxWirePro: NZD/USD fails again at stiff resistance, back-to-back shooting stars counter bullish patterns, can bulls hold triple top neckline? 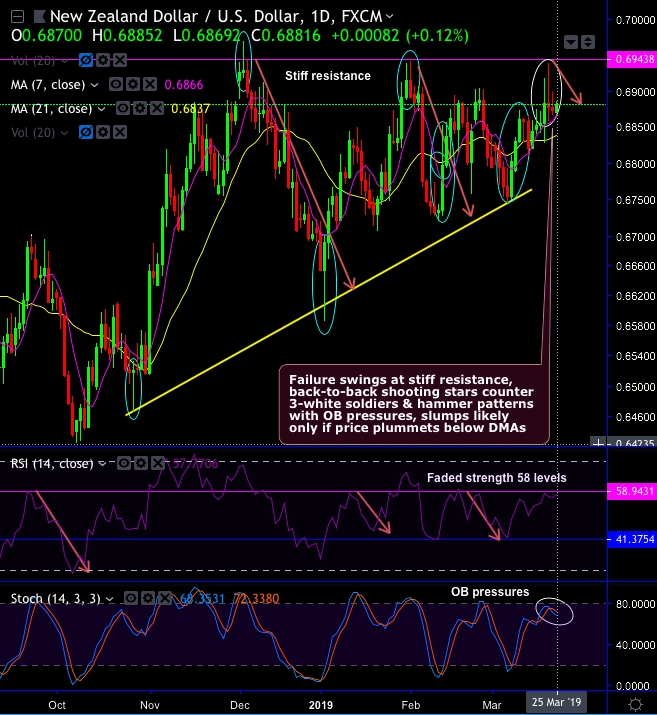 We hope you are now in sync with what we meant to convey about NZDUSD trend. Hadn’t we highlighted bullish potential in the interim trend? But for now, NZDUSD interim uptrend seems to be exhausted upon the failure swings at the stiff resistance of 0.6945 levels, that is where back-to-back shooting stars have occurred to counter previous 3-white soldiers & hammer patterns (refer both daily). But for now, the interim uptrend is slightly dubious as both RSI and stochastic curves show downward convergence ahead of RBNZ’s monetary policy. Currency Strength Index: FxWirePro's hourly NZD spot index is inching towards 120 levels (which is bullish), while hourly USD spot index was at -18 (mildly bearish) while articulating (at 06:09 GMT).